To Come Soon: Audiobook - John Montandon's new book, By His Own Blood, is going to be available soon in audio format for those who like to have a smile from ear to ear. If you would like to be notified when the By His Own Blood audiobook is available for purchase. By His Own Blood by John Montandon is based on a true story. The written word is no mystery to John, as he is a successful business founder, publisher and owner of agricultural publications, online communications, and a radio network. This well written book of the author's personal emotional journey is 288 pages long, 6 x 9 inches, and was published by Rockford Brownstone Publishing. By His Own Blood for Kindle - Many people prefer to read ebooks using the Kindle, Kindle Touch, Kindle Touch 3G or Kindle Fire, the number one best-selling, most gifted, and most wished for product from Amazon.com since its introduction in October of 2011. Sales for Kindle tripled over the holidays. And now we've produced John Montandon's By His Own Blood for your Kindle. Click the Buy button below to purchase from Amazon. For those with an iPad, the By His Own Blood iBook is the way to go. This multi-media rich edition is the way to go. 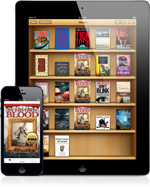 Link your Apple device to the iBook app and download the edition for a unique experience. This book features an introductory video by author John Montandon. Click the Buy button below to explore iBooks. To contact Rockford Brownstone Publishing, click on the contact link above.